OK, this has nothing to do with Breakfast Bruschetta, but I need to say something. I am deeply saddened by the loss of so many Americans a few weeks ago in Afghanistan. Almost everyone that was killed came from the Virginia Beach area.It is their families and friends who grieve. They live in my community. I ask you to join me in prayer for those that were killed. I hope that the grieving family and friends of these brave men will be consoled by our prayers. Oh and one more thing, would you pray also for the men and women still serving our country? I am sure this loss will affect them one way or another. May all of us pray for the day when there is no more need for war. OK I am done! I am getting off my soap box now. Lightly toast the baguette slices. 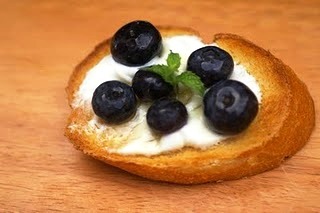 Spread each slice with a tablespoon or so of Greek yogurt. 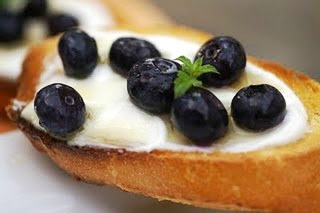 Sprinkle a few blueberries on each piece of toast and drizzle with honey. Put a mint leaf on each for garnish. That’s a nice and quick breakfast, Veronica. I feel the same for the lost of Australian soldiers as well, wish they can come home safe to see their families. Quick and easy breakfast, a fun twist on a wonderful app. Great idea, Veronica! Keeping those families in my prayers today. Great idea. Both the bruschetta and the thought! Our state lost 6 servicemen recently. It seems like everyday the flat is flown at half-mast. Let’s keep them all in our thoughts. How sweet of you to mention your friends & neighbors. We should all count our many blessings. Very creative w/the bruschetta breakfast. Greek yogurt fan! The bruschetta looks amazing and your tribute to our uniformed services is beautiful…..
A lovely tribute to those brave soldiers and their families left behind. It’s so sad the fate that politicians hand out to generations of people with their decisions. Lovely post Veronica. It’s always important to stop and think about our soldiers fighting so far away. And your breakfast bruschetta looks fan-tastic! 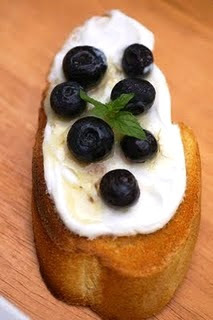 What a lovely Bruschetta and blog post. There are so many people to pray for these days. Thank you for the reminder. I am truly grateful for their service for our country! What a great idea for breakfast! I’m so going to use this one… thanks for sharing it.